First, the Android Play store has become substantially more welcoming to startups/new entrants than 18 months ago. 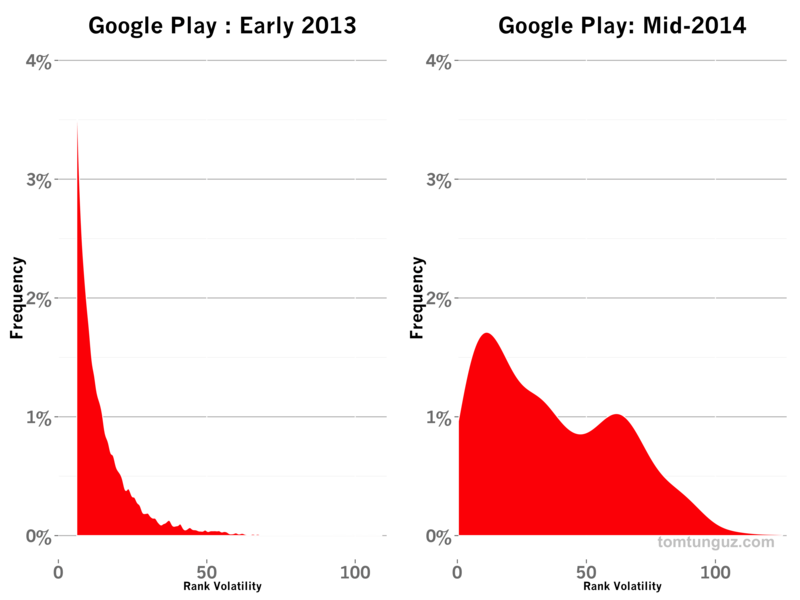 The chart above compares the competition in the Play store in early 2013 and in mid-2014. On the x-axis, I’ve plotted plots the rank volatility, how much a typical app moves in ranking in 30 days on the x-axis. On the y-axis, the chart shows the percent of applications that exhibit that volatility. I’m using rank volatility as a proxy for competitiveness: more changes in rankings in the app store implies more competition and a more efficient marketplace, which should help the best apps rise to the top, even if they are new to the app store. In 2013, apps most frequently moved only 1-2 slots, meaning if an app became #1, it was very difficult to displace. 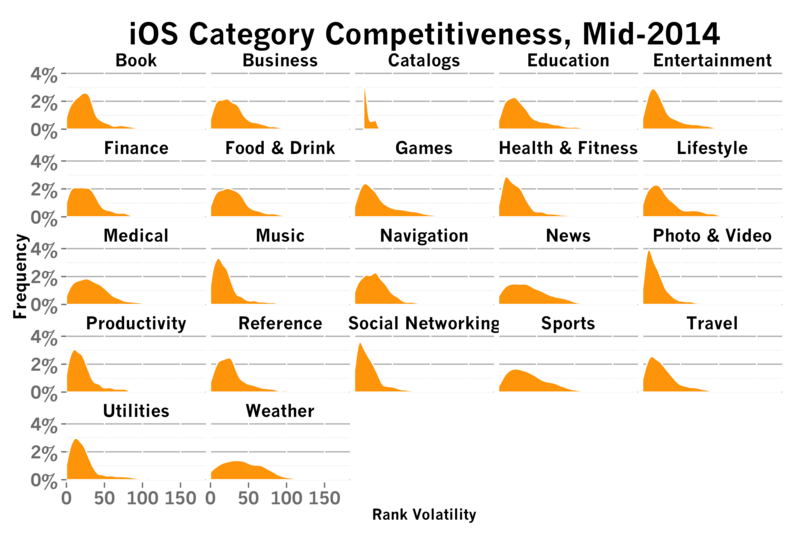 In mid-2014, apps’ rank volatility is far more uniformly distributed, meaning mobile apps are moving up and down all the time, implying strong competition and a vibrant market. Second, the iOS store has also become more competitive. In 2013, many apps controlled their rank, and observed rank volatilties of less than five slots. Today, the fraction of those controlling applications has fallen by 80%. However, unlike the Play store which exhibits a relatively uniform distribution of rank volatility, meaning a roughly equal numbe of apps move 3 slots and some move 75 slots, apps in the iOS store tend not to see swings of 50 or more very frequently. 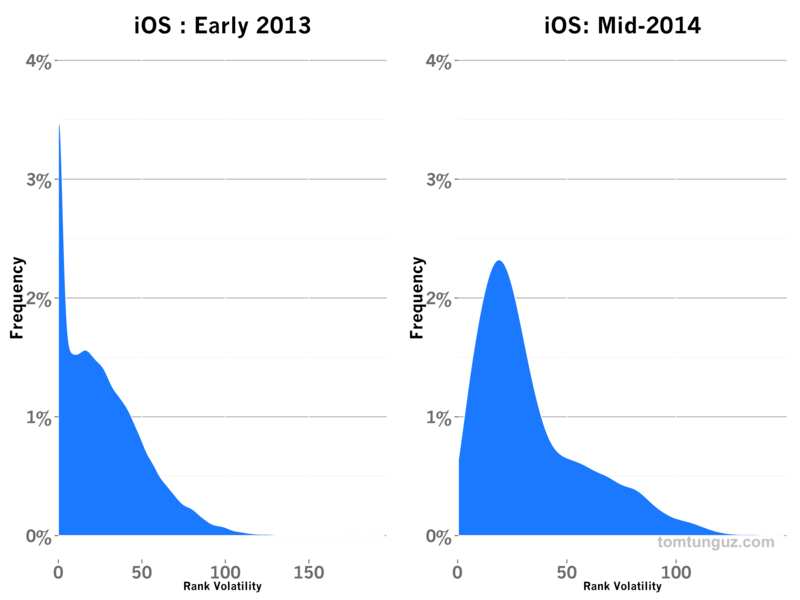 Just like in 2013, today 75% of iOS apps see a volatility of less than 50. Third, the typical app in 2014 swings 10-30 ranks per month compared to 1-5 ranks eighteen months ago. There’s much more jockeying for position. The counterpoint to a greater ease to reach the top 10 or top 50 is that it’s easier to fall as well. This data implies startups must be much more attentive to their app rankings. Staying at the peak of the charts demands more sophisticated organic and paid acquisition strategies, but more importantly, developing differentiated products. Fourth, competition varies by category in both stores. 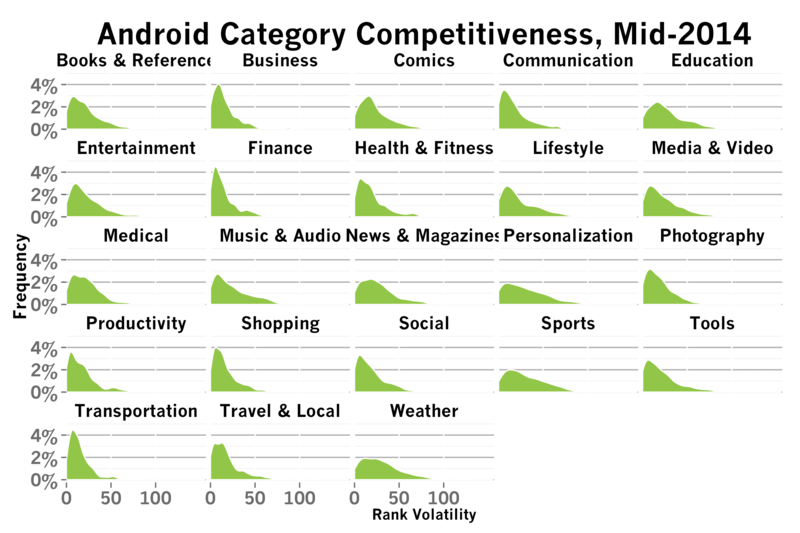 The chart above shows the iOS store and the chart below, the Play store, with the volatility broken down by app category. The concentrated spike in Social Networking indicates very small app rank volatility (the top spots are hard to unseat). Contrast that shape with the statistical mesa of Weather. These differences aren’t surprising. Social Networks tend to create power laws with their user bases - the big become bigger - and this behavior is echoed in the charts. On the other hand, Weather apps, which rebroadcast the same weather data, see much greater movements in app ranks as new and better products are released. The story with Google Play is similar below. During the past 18 months, all the metrics for app stores have grown dramatically especially the number of users and the download counts. The size of the audience for mobile apps presents an even more compelling distribution opportunity for startups to acquire users. In addition, the increasing efficiency of mobile app marketplaces means very few apps are unassailable. The successes of mobile-first social networks like Instagram and SnapChat, despite Facebook’s dominant position in social networking, are concrete examples of this trend. Because of the greater efficiency of these marketplaces, the best apps will rapidly rise to the top and others will quickly fall out of favor. In short, it’s a great time to be a mobile startup with a differentiated product. I’m using the standard deviation of the ranks to create this volatility metric.